FBI and IRS agents raided the law offices of Texas Senator Carlos Uresti on Thursday morning — confiscating documents and other items. A law enforcement source told the the San Antonio Express-News, which first reported the raid Thursday, that it was connected to Uresti’s involvement with a now-bankrupt fracking sand company that he held a financial stake in. Lee confirmed that no arrests had been made. Uresti, a San Antonio Democrat and personal injury attorney, has been entwined in a complicated saga involving FourWinds Logistics, which sold sand used in hydraulic fracturing, a process that extracts oil and gas from shale rock. Three months later, Uresti coasted to reelection, winning his San Antonio seat with 56 percent of the vote against Republican and Libertarian challengers. 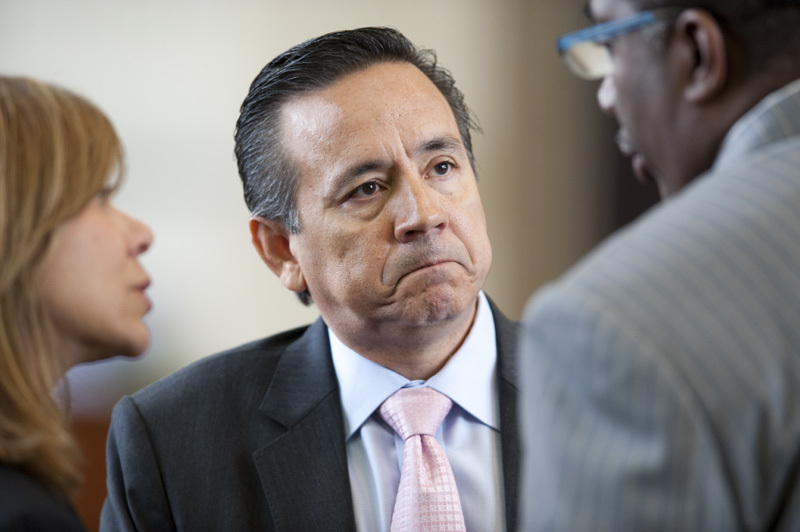 Uresti is among the legislature’s most powerful Democrats. He is vice chair of the Health and Human Services committee and sits on three other high-profile committees: Finance, Education and Veteran Affairs & Border Security. Uresti did not immediately respond to the Texas Tribune’s request a for comment Thursday, nor did staffers in his office. There did not appear to be any law enforcement activity at Uresti’s senate office in the Texas Capitol Thursday morning. On Nov. 4, four days before Election Day, Eric Nelson, the former marketing director for FourWinds, was indicted for his role in an alleged scheme to defraud investors. He later pleaded guilty to one felony charge of conspiracy to commit wire fraud. Federal attorneys accused Nelson of altering company bank statements to “grossly” inflate its account balance. At least two more former FourWinds employees have been indicted since the election: Shannon Smith, who held a 48 percent stake in the company, and Laura Jacobs, who worked as its comptroller. They face similar charges to Nelson’s. FourWinds had paid Uresti to attract investors before it filed for Chapter 11 reorganization in August 2015 — beset by allegations of fraud and misused funds. Cantu’s 13-year-old daughter, 4-year-old son and two friends were killed in 2010, when a tire on her SUV blew out, causing the vehicle to roll over. Her legal team, which included Uresti, secured the wrongful-death settlement in 2013, and about a year later, she said she decided to invest the bulk of the money into FourWinds at Uresti’s urging. Stan Bates, the company’s CEO and majority owner, told Cantu in text messages that Uresti was sharing 10 percent of the profits from her $900,000 investment, court records show. Documents in the company’s bankruptcy proceedings list Uresti as owner of a 1 percent stake in FourWinds. Also, the company granted Uresti a $40,000 in June of 2014, and hired him to perform legal services, the documents show. In August, Uresti told the Express-News that the company never transferred stock certificates to him, and the transfer was never registered by the Secretary of State. But on his 2015 Personal Financial Statement, a document Texas lawmakers must file to the Texas Ethics Commission to shed light on their sources of income and affiliations, Uresti listed owning between 100 and 499 shares of FourWinds stock. That document, first filed in February of last year, did not originally disclose the $40,000 loan. Nor did it show that he served on the board of one of the company’s joint ventures. Uresti corrected the document in August, following the Express-News investigation. He called it an “oversight” that “won’t happen again,” the newspaper reported at the time.